Do you need additional ticket windows or have a venue away from your main ticketing location? We have ticket booth for sale! A recent customer is building a new Baseball / Softball complex that is away from their main ticket office. We were able to help solve their needs with a 4 window ticket booth. They asked for forklift slots built into the base of their ticket booth so it could be lifted and transported to another site where they were going to start ticketing. 8 window ticket booth are more popular than you may think. When you need to get a lot of people in their seats quickly, a ticket booth from Little Buildings is your answer! We often hear clients saying they are thinking of building a ticket booth on site, but then saw our web page. The inconvenience and hassle of having on-site construction makes purchasing a totally assembled portable ticket booth very appealing! 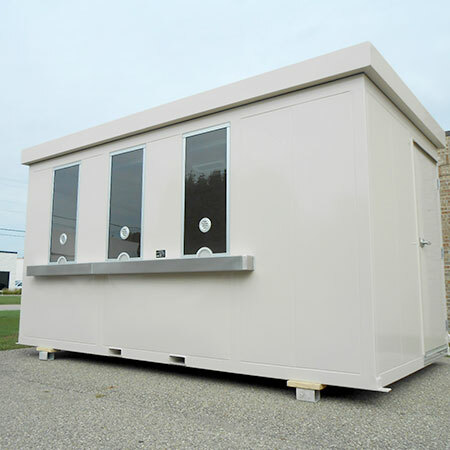 Remember a factory assembled portable ticket booth can be moved onto your pad and ready to set, connect, and use in a matter of hours! 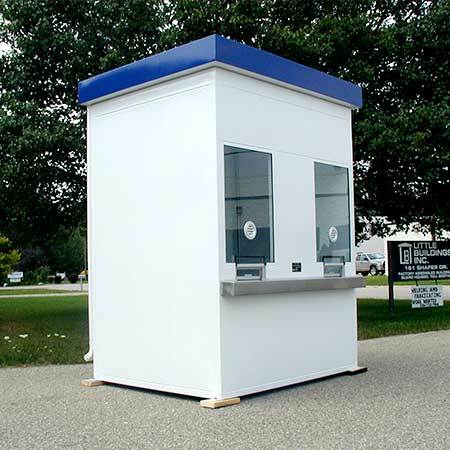 Little Buildings manufactures portable ticket booths for sale, portable ticket booths, ticket offices and bullet resistant ticket booths that are factory assembled and shipped by truck totally assembled, ready for you to set, connect, and start collecting revenue! Start with one of our standard ticket booth models or work with one of our knowledgeable personnel to develop a ticket booth or portable box office that will meet your exact venue requirements! Used by Professional and High School and College athletic teams as well as concert venues and theme parks, our ticket booths and modular ticket offices are ready to help you sell more tickets faster! 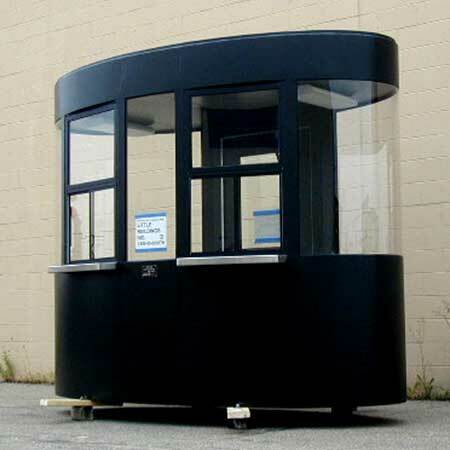 Recognized as the leader in our industry our standard ticket booths or portable ticket booth feature galvanized steel welded assembly assures the unit will stand up to years of rugged demanding service. Clear tempered safety glass is standard in every ticket booth from Little Buildings as well as a steel work counter, swinging (sliding on some models) steel door with lock and hydraulic closer. Choose your paint color for your new portable box office from our large color chart available by email. Electric package includes a small heater, fluorescent light with lens and wall switch, one electrical outlet per window, and all wiring to a wall mounted circuit breaker box with main breaker. Ticket booths with one to 8 window are offered. The most popular is our 4 window ticket booth followed by the 2 window ticket booth. Any ticket shack can be customized to meet your particular ticketing need. Our modular ticket office can be shipped worldwide. Little Buildings can also make you a custom ticket window configuration, just ask us, we have ticket booth for sale! Optional features include built-in fork lift slots for ease in relocating from one venue to another, wall or roof mounted air conditioners, tinted glass, exterior lighting, signage, and data outlets. 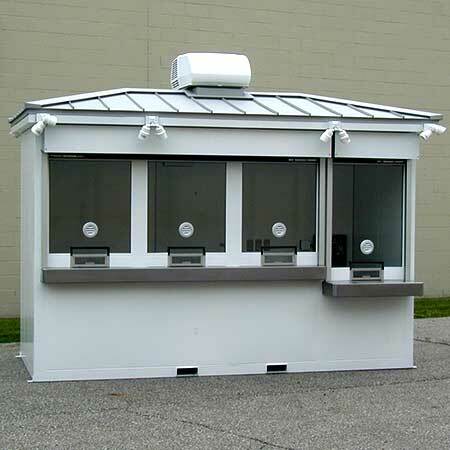 Add heavy duty galvanized steel roll-down shutters to cover the ticket booth windows during off season and cash drawers and internet connections for a complete satellite ticketing remote location! Little Buildings also manufactures bullet resistant ticket booth and ticket office. Ticket booth door location can be moved without affecting price or add windows for additional light or ventilation. Contact us toll-free at 1-888-55-BOOTH or 1-586-752-7100 or email info@littlebuildingsinc.com. Don't settle for second best, go with the leader in TICKET BOOTHS and PORTABLE BOX OFFICE, Little Buildings, Inc! At this time we do not rent or lease our ticket booths. If you would be interested in purchasing a Little Building ticket booth for rental from your company please contact us. We would be happy to send you rental referrals in your area when we get them!